So you may be aware I purchased myself a lovely Olympus Om1n with a 50mm 1.8 Zuiko Auto-s not too long ago, a camera I have wanted to own for some time, and talked about here. These are some photographs from the first roll of film developed, I only ran one through in case of any issues (no point wasting money/film if the damn thing doesn’t work properly) and I’ve been pleasantly surprised with how these have come out. These are all shot on Kodak Colorplus 200 ISO colour film that expired in January 2014, a film I’ve used previously and gives nice results so probably my main surprise came from how nice the images looked considering the lens cost me around £20. 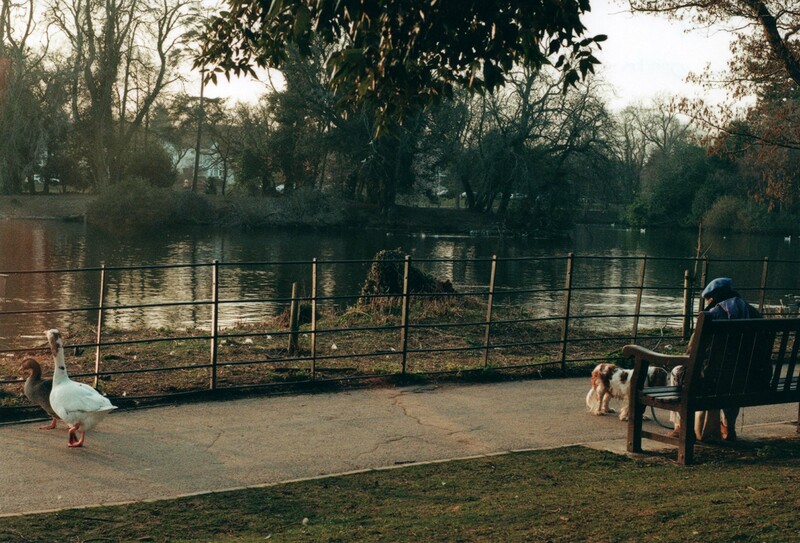 So below are a few examples taken during a late afternoon/early spring evening in Roath Park, Cardiff. First up is this shot of an older lady and her dog and a stand-off between a pair of geese, I say that as the geese were pretty unimpressed that the poor old lady dared to sit on a bench in their patch. This was taken at f11 125/sec. 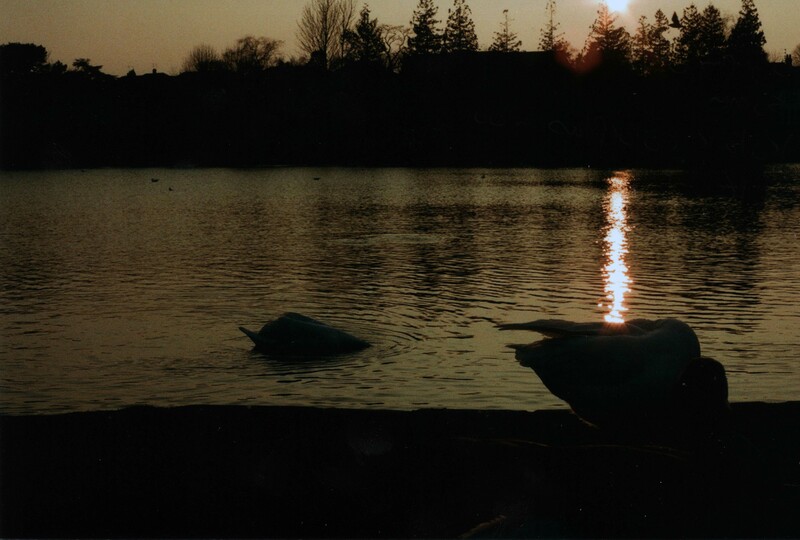 First thing you’ll notice is the brownish/red lighting to the left of the image, I don’t think this is a light leak as I have no other photographs on the roll showing anything like this, the sun was just out of shot in that direction and low in the sky so I think this is purely the way the light is reflecting on the lake. I like how the tree branch in the top right corner and overhanging leaves at the top of the image frame this shot, I think the heavily exposed sky would be a bit too overpowering without them. I also like the level of details that’s been captured, the cracks in the path, some of the individual leaves standing out against the bright sky and the grass. I also like how the leading lines of the path and fencing lead from one subject to the other, from the seated lady at the bench to the geese. A little later into the afternoon as sunset started approaching I shot this at f16 1000/sec. Yes this is very dark but I’m still impressed with the level of detail, the ripples on the water for example and the individual blades of grass in the foreground. 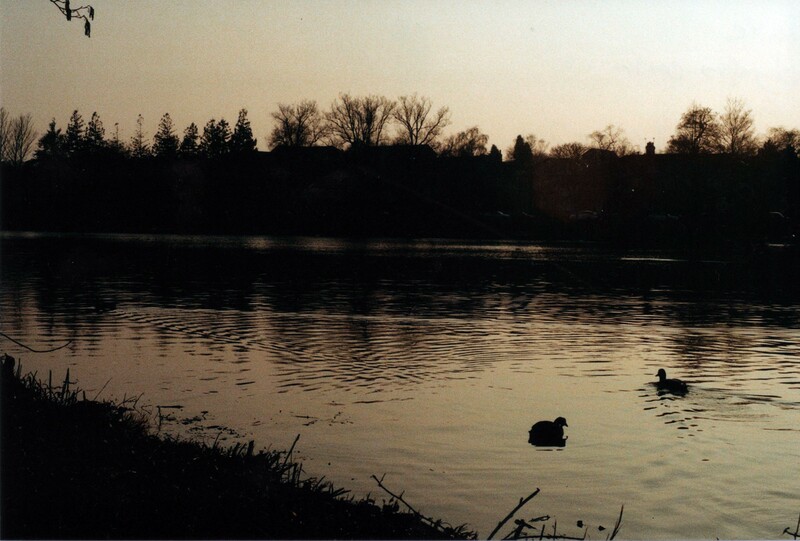 I really like this shot, perhaps because the darkness is nicely balanced by the colours of the sky reflecting in the water of the lake and the pair of ducks silhouetted against that. And finally we have this shot of two geese at the water’s edge, taken at f16 and 500/sec. I love the colours in this, silvery orange contrasted by the dark shadows of the trees against the sky and the bodies of the birds against the water. And the way the sunlight has been captured against the water, leading the eye either upwards from the goose to the sun low in the sky or down from the sun itself across the frame to the roosting bird, there’s even a pleasant if small lens flare to the top right of this shot. In all I’m quietly impressed with this camera, granted a lot of the things I like about the photo’s it produced are down to the film I ran through it but the quality of the lens for the price paid has hugely impressed me. I’ll be posting some more examples from this roll over the next few posts, and now I’m sure how what the Olympus can do it’ll be spending a lot more time with me when I’m out and about. I totally agree with lilypup… your narration brought aspects of the pictures to my attention that I may not otherwise have noticed. Really interesting post.